The next film in Treasures From the Warner Archive is one to which I’ve been looking forward for some time. Perhaps the most highly respected film of Norma Shearer’s silent career and featuring the screen debut of a future Hollywood legend (more on that later! ), it is a hallmark of the early MGM period and a shining example of the beautiful and complex character-driven narratives that came out of the silent era. The film is Lady of the Night, and it’s a real crowd pleaser. A father is sentenced to 20 years in prison by a judge who has a daughter around the same age. Leaving the courthouse, he sees the judge cuddling with his daughter. “Pretty soft for your kid, but what about mine?” he cries, as he is carted off to jail. Eighteen years pass, and both daughters are graduating from school–Florence, the judge’s daughter (Norma Shearer) from a select school for young women, and the convict’s daughter Molly (also Norma Shearer) from a reform school. The stark contrast between the lives of the two girls is seen right away–Florence’s world is photographed in a red tint, and her school is surrounded by flowers and trees, her friends smiling and skipping down the path following their graduation. Molly’s world, on the other hand, is photographed in stark black and white, and her school is nothing but a block of cement. She is dressed in a drab black dress, with a simple hat and no makeup. Molly’s world is a grim one, and with nowhere to go and nothing to do, she turns to taxi dancing to earn a living. At the club where she works, Molly is assaulted by a stranger and resists with all her might–kicking, hitting, and biting him. A man by the name of David Page helps wrench the man off of Molly, and to thank him for his kindness, Molly accepts a dance with him much to the chagrin of her boyfriend, Chunky (George K. Arthur). Soon, Molly begins to fall in love with David but David doesn’t see her as a romantic partner, only a good friend. David, an inventor, has invented a device that can crack safes, and Molly advises him not to give his invention to crooks, despite the high price they might pay. “Don’t go crooked, it don’t pay,” she says, drawing on her own experience growing up fatherless. She tells him to sell his idea to a bank, who will use it to keep thieves out. The next day, David goes to the board of a bank to pitch his idea. The meeting was held at board member Judge Banning’s house, and on his way, he bumps into Florence. The two lock eyes, and Florence also begins to fall in love with Dave. This time, it is mutual and they begin dating. One day David takes Florence to his studio when Molly walks in, unaware that he wasn’t alone. She and Florence meet, and after Molly walks out, she says to David “She loves you, David, I can see it in her eyes.” She follows shortly after Molly and finds her sitting in Florence’s carriage. Molly implores Florence to marry David and make him happy. Florence expresses concern for Molly, and when Molly says she can be happy with her own boyfriend, Chunky, the two hug. All ends well with a tinge of bittersweetness at what could have been–with Florence marrying David and Molly marrying Chunky. It is in the carriage scene that we see the very, very brief screen debut of an actress who would become an immortal Hollywood star. A young actress by the name of Lucille LeSueur had recently come to Hollywood and was being tested out in bit parts. In this role, she plays Norma Shearer’s double for the hugging shot. Within 2 years she would hit it big, and under the name of Joan Crawford, she would become perhaps one of the most important and influential stars of Hollywood’s Golden Age. 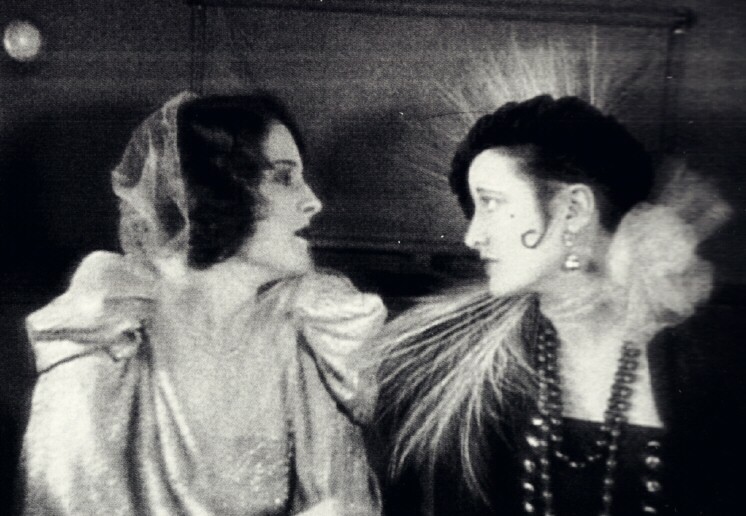 Norma Shearer, on the left, with Joan Crawford acting as Molly’s double on the right. The significance of Joan Crawford’s screen debut against Norma Shearer is lost on very few fans who are familiar with the backstory of classic Hollywood. Joan Crawford’s career skyrocketed very quickly, and by the early 1930s she was one of the reigning queens of the MGM lot. Norma Shearer, always a huge star in her own right, married MGM production chief Irving Thalberg in 1927, becoming not only one of MGM’s biggest assets financially but also gaining an influence and control within the studio that was hard to shake. Joan Crawford and Norma Shearer became bitter rivals at MGM in the 1930s, with both asserting their power to its full extent. Because of her political influence within the studio, however, Norma usually won out, prompting Joan to quip “How can I compete with Norma when she’s sleeping with the boss?” They later appeared in 1939’s The Women playing competitors for a man’s affections–not far from their real life situation. At its core, the story of Lady of the Night has a complexity that is quite thought-provoking. Much of it, in my analysis, has to do with the fact that Norma Shearer plays the dual role of a judge’s daughter and a convict’s daughter. This prompts the audience to rethink any prejudices they may have had coming in regarding “the girl from the wrong side of the tracks,” and instead judge the characters by their internal qualities. In addition, this dual role shows us the remarkable range of Norma Shearer’s acting abilities. Shearer was one of the rare performers in Hollywood who successfully made the transition from silent film to sound, and 5 years before her Oscar-winning turn in the sound film The Divorcee, Shearer was proving that she had the versatility of the best in the business. As Molly, she is hardened and rough but with a heart of gold–and as Florence, she is soft and demure. The ability to be able to switch from character to character with such aplomb and so quickly is a gift rare indeed. If you would like to watch Lady of the Night, click here. It is worth watching for the tremendous performance of Norma Shearer, and for the place it has in the silent film pantheon. This entry was posted in Lara Gabrielle Fowler and tagged 1925, joan crawford, lady of the night, norma shearer, Silent Film, warner archive, warner bros.. Bookmark the permalink.